Product prices and availability are accurate as of 2019-04-21 05:29:05 UTC and are subject to change. Any price and availability information displayed on http://www.amazon.com/ at the time of purchase will apply to the purchase of this product. 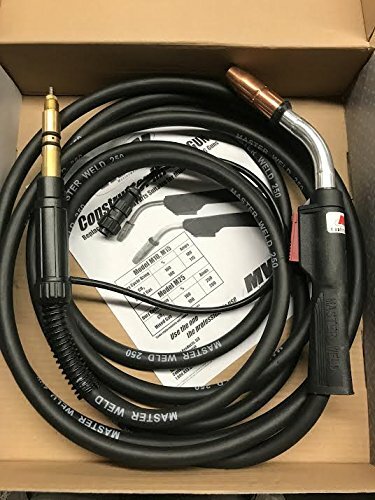 MADE IN USA This is a brand new 20 ft, High quality MASTERWELD replacement m25 welding mig gun. This gun is a direct replacement for a Miller MIGmaticTM M-25 welding gun, Part # 169597. The front end parts of this gun are completely interchangeable with the Miller gun - that's right, it uses the same 169 726 gas nozzle, the same 169 728 tip adapter, the same 169 729 nozzle adapter, and the same contact tips as the OEM Miller gun. It fits all of the following models: Millermatic® 200, 210, 212, 250, 250X, 251, 252, and Vintage This 20ft long gun will handle .035" and .045" diameter welding wires. It will feed all types of wire, steel wire using gas, flux cored wire requiring no gas, stainless steel wire, and with a teflon liner, you can feed aluminum wire. It comes standard with a .035" diameter tip in the welding gun. If you need extra tips, nozzles and tip adapters, now is a great time to stock up, as they ship for no additional shipping charge. This Welding gun is a direct replacement for the GA-20C, GA-21C, and M-25 welding guns.